I opened this book with doubt and reluctance, for I am naturally not a fan of tender stories that tug at your heartstrings with their dramatic flair and saccharine verbiage. 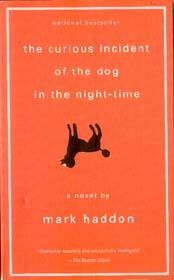 But The Curious Incident of the Dog gives you none of that, and this quality of the book- that light, funny, and innocent atmosphere- makes the story of Christopher even more heart-rending. The point of view of the story makes the book uniquely special. It is chronicled and narrated by Christopher, an autistic teenager who is intent on finding out the murderer of his neighbor’s dog. The story was narrated cleanly and simply, which adds to the fact that all Christopher writes is the truth. All that is deemed to be chronicled are only those that he observed with his very eyes, and those that he felt and learned. The objectivity of the way Christopher feels and thinks provokes such emotion in me because I could see how different he is from normal people. The book opened me to the idea of what sets autistic people from the rest of the world. The author was able to show that Christopher does not have a different world, but a different way of seeing the world. The world for him should be a fruit of logic and objectivity. This accounts for the fact that throughout the novel, there are bits and pieces of trivia, as Christopher is fond of showing people that life is like a math equation. The readers are not let in on his world, because he has no separate, delusional world, but he lets readers people to see with new eyes, with his eyes. Surprisingly, as his curiosity compels him to find out who killed the dog and make the pieces fit, he realizes the cold brutality of his discovery, not just about Mrs. Shear’s pet, but also about his own life. Uncovering the truth though, is only half of the whole experience. It is actually about how Christopher, an autistic child, reacts to and faces the truths laid bare before him that make this novel a staple in every bookworm’s personal collection. If I were to choose among my pile of chick literature for my favorite, I would say that the Shopaholic series tops the list. Rebecca Bloomwood, the series’ main protagonist, takes you to a never-ending ride of shopping trips and funny escapades that her spendthrift ways bring about. The books are as shallow as any chick literature would be, but the type of superficiality that Kinsella’s books offer differ from the usual nonsense blabbering of other chick literature protagonists. Confessions of a Shopaholic gives you a never-ending ride of shopping galore, with Rebecca’s sweet and exciting romance with Luke Brandon, the multimillionaire PR representative, as a bonus. The second installment, Shopaholic Takes Manhattan, portrays Rebecca as an even more avid shopper as she goes to New York for the first time. I have read four out of the five installments, and my favorite would have to be the third one so far. Shopaholic Ties the Knot is beautiful because we see a more mature (but definitely still an extravagant) Rebecca as her once-budding romance with Luke becomes permanent and even more enchanting. This kind of chick literature is a good break from the classics and other heavy reading, so it is perfect for the summer or for escaping the tiring demands of work. But its shallowness is not so that it will make you cringe at every page. The superficiality is served through witty writing that British authors are so famous for, and Kinsella does not exaggerate or fail in her insertion of humor throughout the stories. The Shopaholic series is something I always recommend to my friends because it is a light read, yet it does not go overboard in its superficiality. Though Rebecca’s spending habits and her tendency to avoid and ignore her monthly bills might be a little too much, and irksome at its worst, there is still that sensible touch to the whole series that prevents me from dismissing it as a mere novel-version of Vogue. Personally, ever since I have read the book, I have developed a renewed sense of fashion style. Reading about Rebecca’s fashion predicaments, the constant name-dropping of high-end fashion labels, and the vivid depiction of shopaholic must-haves that Rebecca espouses indirectly made me aware of fashion what-nots and know-hows. Such examples would be the Hermés scarf that Luke gave her in Confessions of a Shopaholic or the Angel bag that she “just had to buy??? in the third installment. 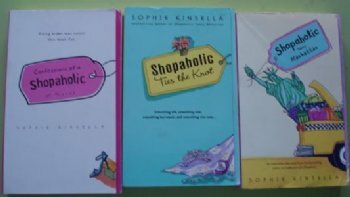 So, if you want some delightful chick literature to read, then the Shopaholic series is the way to go. Not only does Rebecca take you to a different level of fashion and sensibility as she traverses modern-day life with style and sophistication, but the series actually makes you realize the difference between an outfit from the ordinary jeans-and-shirt get-up.